1. Cottage cheese, beat in a blender, dobaviv yolks, sugar, vanilla sugar, butter, starch, semolina, until smooth. 2. Beat whites with salt until peaks. Carefully vymeshivaem in cottage cheese. 3. Take 3 tablespoons of cottage cheese, add the flour and cocoa, mix well and form the «hearts» and «balls». 4. Put the cottage cheese in a baking dish, which should be sent with baking paper. In a lot talkive at different depths «hearts and balls. 5. Bake in the oven at 180 gr. approximately 45 minutes. Let cool in the form. 6. On a water bath melt the dark chocolate and draw on paper for baking shouldnae «hearts» and «circles». 7. Also rastaplivaem in a water bath white chocolate, peremium with cream. 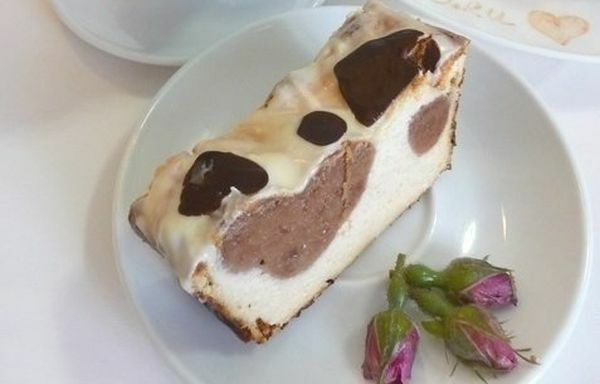 Cover the cheesecake with white chocolate and decorate with «hearts» and «circles».